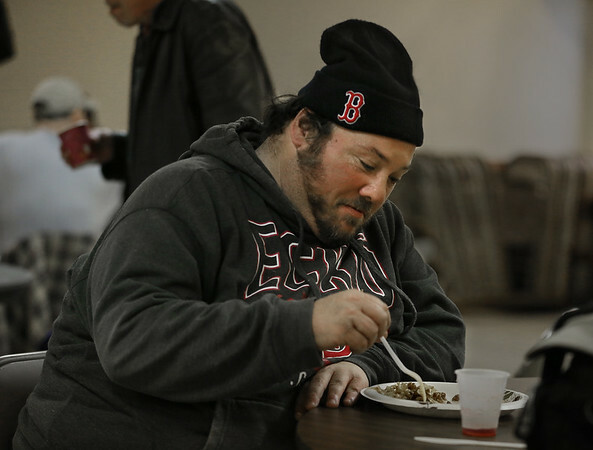 Salvatore Frontiera enjoys a warm meal Thursday at the Grace Center in the basement of the Trinity Congregational Church in Gloucester. A former fisherman who in recent years has scraped out a living collecting scrap metal, Frontiera said he has been homeless for several weeks but expects to move into an apartment at the beginning of May. He had nothing but praise for the Grace Center. "It's a great place to go in the day," he said. "It's cold out there."